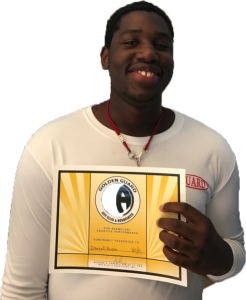 The Zion Park District announced today that Lifeguard Darryl Bryson has been awarded the prestigious “International Golden Guard Safety Award” in a recent unannounced Aquatic Safety Audit. This coveted achievement is reserved for those individual lifeguards observed performing their normal job duties while exhibiting behaviors that surpass the expectations of all safety standards in the areas such as swimmer surveillance, professionalism, and vigilance. It is important to note that only about 1% of all lifeguards evaluated at Ellis & Associates client facilities receive this honor annually. “We are excited to recognize lifeguards who are clearly the best of the best. This lifeguard is a role model for lifeguards everywhere and further underscores the fact that guests at this facility are afforded the highest degree of swimmer protection currently available in the aquatic recreation and amusement industry” said Richard A. Carroll, Jeff Ellis & Associates, Inc. Senior Vice President & COO. Golden Guard Safety Awards are presented to lifeguards whose facility participants in E&A’s Comprehensive Aquatic Risk Management (CARMP) and are based on the results of their individual performance in Unannounced Aquatic Facility Operational Safety Audits. These audits include undercover video surveillance of individual lifeguards while they protect their Zone areas, in order to accurately evaluate their professional diligence. Additionally, individual and team basic life support and skills are evaluated, along with simulated emergencies that measure the effectiveness of established Emergency Action Plans. The audit concludes with administrative, supervisory and facility evaluations.